Why is fishing such an overwhelmingly male occupation? Perhaps it is because women have the good sense to do something more productive than wave rods about hoping they can deceive, with lure or bait, one of the less intelligent creatures on this planet. Women seem to know they are cleverer than fish, whereas many men feel the need to prove it on a regular basis. That is one theory. 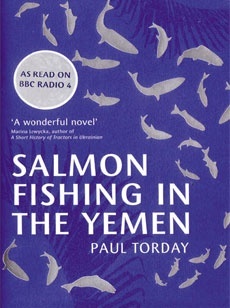 Another, for which there is much evidence in this delightful book, is that fishing is balm to the soul. Unlike women, who prefer practical activities like earning money and getting on with life, men display a worrying desire for the peaceful contemplation of beauty, which fishing in the right environment permits. The sheikh feels that the soul-cleansing nature of salmon fishing would help his troubled country find peace. So, notwithstanding that salmon rivers tend to be in wet, cool places, His Excellency Sheikh Muhammad ibn Zaidi bani Tiham decides to employ Dr Jones to design and oversee a project to establish a salmon hatchery in the Arabian desert. I will not describe the plot in detail, but suffice it to say one of the nicer aspects is the unconditional demise of two of the villains of the story, the supercilious, media-driven Prime Minister of Great Britain and his manipulative, workaholic press secretary. But they are peripheral to the tale, which has two main strands, the salmon project and the emotional development of Dr Jones. He is married to a mercilessly practical, emotionally stunted, high-achieving banker whom he met at Oxford. But he falls in love with the other important executive in the salmon project, the smart, attractive Miss Harriet Chetwode-Talbot. She is engaged to a British Army Captain serving in Iraq. When he is killed in action, she is devastated. She reaches out to Fred. But the age, class and culture gap between them is too wide to bridge, so he goes back to fish management, where he finds more peace and contentment than with women and the real world. The story is told through a series of emails, press reports, Hansard entries and interview transcripts, which some readers might think interferes with the narrative flow. But a thread of satire on the ghastly emptiness of modern British bureaucratic life runs through the book. This is undoubtedly helped by the direct quotations. When Harriet, for example, distraught at the death of her beloved fiancé, tries to find out how he died and where, the Army is totally uninterested. She is referred to something called the Bereavement Management Centre in Grimsby, and sent a premium call rate phone number and an email address. When she persists, she gets the email below from bereave@grimsby.com. It is perhaps symptomatic of a country that treats its war widows in this way that the publishers of this book have seen fit to append to the author’s text three pages of Reading Group Notes. These give suggested topics for discussion. No wonder men go fishing.